MEXICO CITY - U.S. President Donald Trump has been the world’s worst headache for the past 18 months, and arguably no country has suffered more than Mexico. Of the three main contenders in Mexico’s just-completed presidential election, none was as ill-prepared as the winner, Andres Manuel Lopez Obrador, to manage the bully in the White House. Nonetheless, the Mexican people have chosen him, and he will have to deal with Trump for much (if not all) of his six years in office. 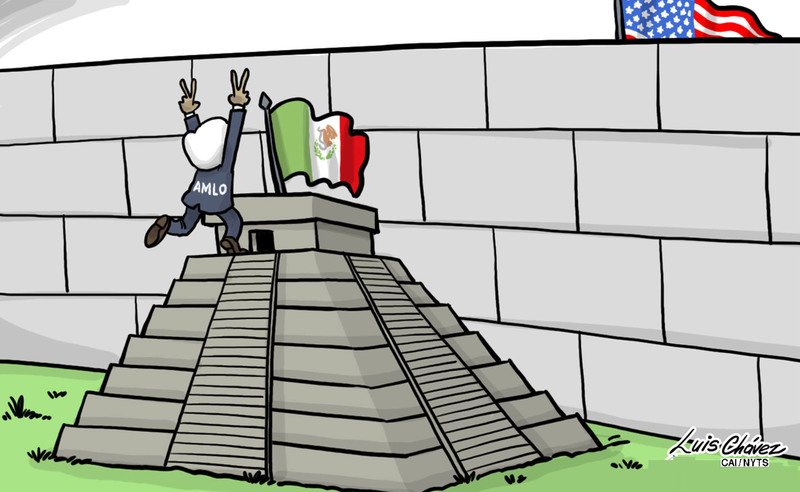 Mexico’s relations with the United States were not a central campaign topic, nor will they figure among Lopez Obrador’s priorities. But they will surely affect Mexicans more than most other issues. There are similarities between Lopez Obrador and Trump. Both appear to be sincere economic nationalists: Trump hopes to make the U.S. self-sufficient in aluminum and steel, while Lopez Obrador seeks the same for Mexico in corn, wheat, beef, pork and lumber. Both disapprove of trade treaties, although they temper their aversion with pragmatic selectivity: Trump left the Trans-Pacific Partnership, but not the North American Free Trade Agreement (for now), while Lopez Obrador says he will continue to re-negotiate NAFTA with the U.S. and Canada along the lines pursued by the current president, Enrique Pena Nieto. Each man profoundly dislikes the other’s country and panders to their nationalist supporters, who occasionally take their deep-rooted passions to extremes. But both know that they must negotiate, accommodate, and conciliate on-the-ground realities. Despite these resemblances — or precisely because of them — Trump and Lopez Obrador are almost certain to plunge U.S.-Mexican relations to new depths of suspicion and strain, as objective factors and subjective fervors aggravate old tensions and fuel new ones. Trade, immigration, drugs, security, and regional issues will continue to dominate the bilateral agenda, and on all these fronts, Lopez Obrador will face the most adversarial U.S. president in nearly a century. On trade and tariffs, while Lopez Obrador’s specific stances are unknown, many of his economic proposals contradict the letter or the spirit of NAFTA. Establishing floor prices for many agricultural products, and ensuring that Mexico produces what it consumes, runs counter to many NAFTA provisions — and to Trump’s goal of reducing the bilateral U.S. trade deficit. Lopez Obrador, who will take office only on Dec. 1, has pledged to uphold the treaty and continue talks to revise it. Even in the best case, however, the changing of the guard will delay any final agreement and ratification by the three countries. In the meantime, Trump’s constant threats to withdraw from NAFTA or impose new tariffs — for example, on Mexican automobile exports to the U.S. — will inevitably irritate Mexico’s new leaders. Immigration will probably be an even touchier subject. Trump’s insistence on building a wall along the entire border, the rising number of Mexicans deported from the U.S. heartland, Central American migrants crossing Mexico, separate detention of immigrant children, and Trump’s diplomatic and rhetorical pressure on all these fronts will not make things easier. Pena Nieto’s kowtowing to the U.S. on most of these matters, ever since he invited then-candidate Trump to Mexico City at the height of the presidential campaign, will logically lead Lopez Obrador to distinguish himself as much as possible by standing up to Trump as often as he can, if only symbolically. Pena Nieto warned that he would use immigration and security as bargaining chips in pursuit of a holistic approach to all issues on the bilateral agenda. He never did. Once Lopez Obrador moves beyond his simplistic views and understands the complexity of the issues involved, he will be tempted to do what Pena Nieto dared not. Mexico can use a number of tools on immigration, such as loosening controls on its southern border with Guatemala or refusing admission to deportees from the U.S. unless American authorities can corroborate their Mexican nationality. With midterm elections coming in November, and the 2020 presidential campaign just around the corner, Trump will find it difficult to desist from stoking his supporters’ nativist animus. The war on drugs is at a similar crossroad. The opioid crisis in the U.S. shows no sign of abating, and a significant share of the heroin and fentanyl it consumes comes from Mexico, directly or in transit. Conversely, a growing number of U.S. states are legalizing medical and/or recreational marijuana; Canada has done the same. While Lopez Obrador is highly conservative on these matters and opposes any kind of legalization, he will find it difficult to maintain previous levels of cooperation with the U.S. on drug enforcement. The public’s animosity toward Trump and resentment of the covert, intrusive and probably illegal nature of the collaboration instituted by his two predecessors will not easily allow it. Lopez Obrador has insinuated that he believes in some sort of amnesty for small-time marijuana and poppy growers, though not for kingpins. But the line between them is not always clear. The peasants in Guerrero cultivate poppy for the cartels, not for their own livelihood. 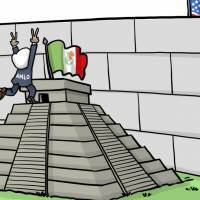 And the U.S. Drug Enforcement Administration will not look kindly on any backtracking from previous Mexican presidents’ commitments to continue waging a costly, bloody and futile war of choice on drugs in Mexico. There are other issues on the U.S.-Mexican agenda, of course, ranging from intelligence sharing and counter-terrorism to regional crises such as Venezuela, Nicaragua, and possibly Cuba. Lopez Obrador will almost certainly maintain Mexican cooperation on the first set of issues, while retreating to Mexico’s traditional and archaic anti-interventionist stance on regional diplomacy. But Trump cares more about security than he does about Venezuelan President Nicolas Maduro or Nicaragua’s Daniel Ortega, so a real rupture here may be avoided. The hunger for change in Mexico, and the outgoing administration’s incompetence and loss of credibility, probably made Lopez Obrador’s victory inevitable. Now Mexicans will have to face the consequences of their choice, just as their country — more than most — must face the consequences of the choice the U.S. made in 2016.